What can I tell you about this? I served this soup as one of the appetizers at my last TK dinner and it received quite the rave reviews. I could probably have served this as a meal in itself with just some good bread - but there was a lot of food still to come out so appetizer it was. It comes together pretty quickly and in this Sacramento heat is quite refreshing. I think I originally found this in an old issue of Food and Wine. I of course made a couple changes based on flavor and the need to prep ahead of time. I also HIGHLY recommend you only use fresh crab - we did do a tasting with imitation crab and that was a definite "no go". 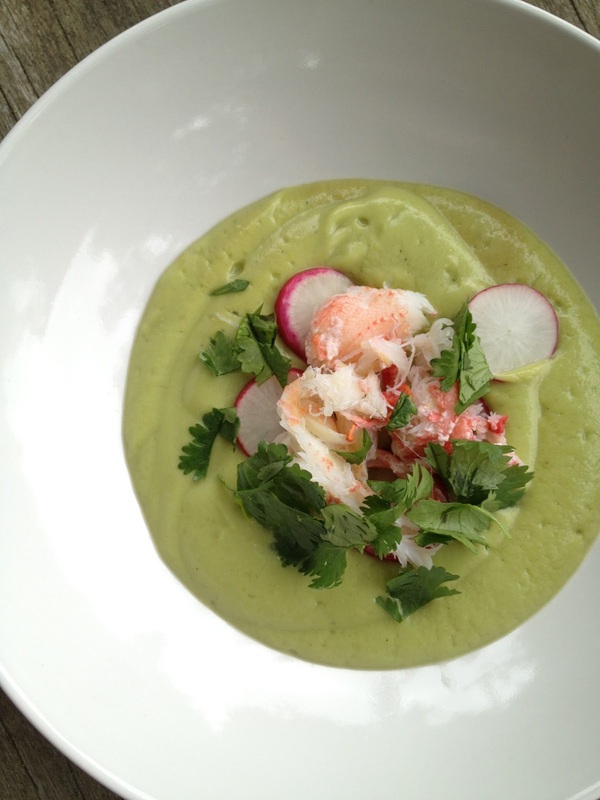 If you love avocado you will truly enjoy this dish. 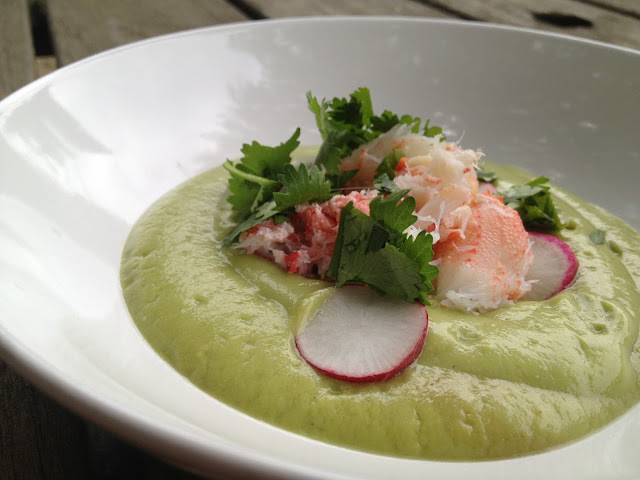 puree the avocados in a food processor with half the lime juice, the milk and 2 cups of vegetable stock until smooth. add a pinch of cayenne pepper and salt and pepper. give it a couple more pulses and taste. here i added another couple tablespoons of lime juice and a couple more pinches of cayenne pepper. at this point it's pretty thick - keep adding vegetable stock until you reach a consistency you like. when ready - ladle into bowls, garnish with a sprinkling of fresh pepper, the sliced radishes, the crabmeat and the cilantro.